rodpedersen.com: COORS LIGHT RECAP: PATS DROP 5-3 DECISION IN P.G. COORS LIGHT RECAP: PATS DROP 5-3 DECISION IN P.G. 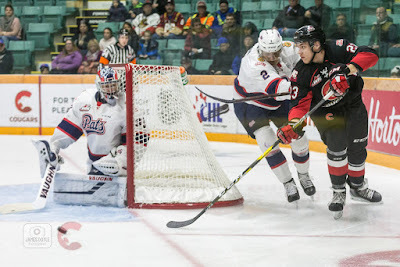 PRINCE GEORGE - The Regina Pats closed out their west coast road trip with a 5-3 loss in Prince George to the Cougars on Friday night. In the first, the Cougars opened the scoring while shorthanded at 5:58 thanks to Jackson Leppard to make it 1-0. Prince George added another at 11:40 from Joel Lakusta and it was 2-0 Prince George after one. In the second, Nick Henry scored a hat trick in the span of 6:59 of the second. His 13th, 14th and 15th goals of the year. The Cougars got one in there as well and it was a 3-3 game. Regina got into some penalty trouble after that and the Cougars scored on a 5 on 3 powerplay to lead 4-3 after two periods. In the third, the Pats threw everything at the Cougars, hit two posts, but could not find the tying marker. Prince George would score into an empty net late and take the game 5-3. Regina outshot the Cougars 33-21. The powerplay was 0/5 and the penalty kill 3/4. Nick Henry led the offence with three goals, while Max Paddock made 16 saves. - Nick Henry recorded his fourth hat trick in a Pats uniform in the second period in a span of 6:59. - Nick Henry finished the six-game road trip with seven goals and four assists. - The Pats finish their west coast road trip with a 1-5-0-0 record. The Pats are back in action on Friday in Brandon against the Wheat Kings at 6:30 p.m. Regina time on 620 CKRM. Next home game is Saturday, December 1 against the Prince Albert Raiders. Tickets are available at reginapats.com, the Brandt Centre Box Office and at any Regina Safeway, where Fun Zone tickets are $13 plus tax.